The mysterious ancient Indian settlement located in Aztalan Wisconsin, dating to around 1,300 CE reminds archaeology of how complex and strange history can be. Some researchers believe a Mississippian culture once lived here before abandoning the site due to lack of resources, by examining artifacts discovered on site. However, no written language or legends of Aztalan have been passed down throughout the ages to give us a better understanding of who they really were. According to local history, farmers plowed over the land for years before its discovery. 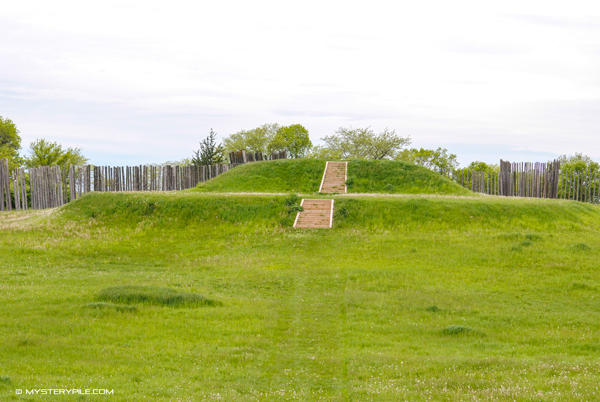 One of the most striking facts about visiting Aztalan is how much the effigy mounds resemble step pyramid construction, though it's important to note stone steps seen in the image were later added during site restoration. Even the site's discoverer, Timothy Johnson mistook the site for having an Aztec influence. These flat top mounds are said to be part of ceremonial practices, possibly even to house a sacred fire at each end of the settlement. Located on the Crawfish river bank, Aztalan once was a heavily fortified area with what appeared to be wood stockade walls and several watchtowers surrounding the area. The stockades appear to be related to a Mississippian site near St. Louis, called Cahokia. In the early 1950's survey work helped establish the stockade path which was later rebuilt using discarded telephone poles. Several effigy and burial mounds are located this general area of Wisconsin, ranging in size and shape, dotting the kettle moraine. One of these mounds stands apart from the rest and is considered to be possibly the strangest mystery of the Aztalan fort. Deemed the Princess Burial, human remains were discovered with nearly 2,000 clam shell beads, some of which came from as far away as the Gulf Coast. It gets stranger, though. In the same area, not far from the main fortification, remains with distinct characteristics of an ancient Woodland Culture were discovered near Lake Delavan and Lake Mills. The skeletons here appear to be giant-like humans with some reported as tall as 10 feet with equally proportionate bone girth. Some believe these skeletons are proof of giants described by ancient cultures and in the Bible, though conclusive proof has yet to be placed on the table. Anthropologists argue the remains may have appeared to be giants due to soil shifting and settling which causes the bones to spread apart slowly over time.